An application for draft plan of subdivision and zoning by-law amendment approval was submitted to the Town of The Blue Mountains and the County of Grey in 2016 to develop a 26 ha (65 acre) of land on the south side of Old Lakeshore Road, between the Craigleith Community centre and the Eden Oak lands. This property should actually be protected from development in its entirety. It’s the site of major Petun and Wyandot aboriginal villages abandoned in the 1600s when Iroquois raided the area. 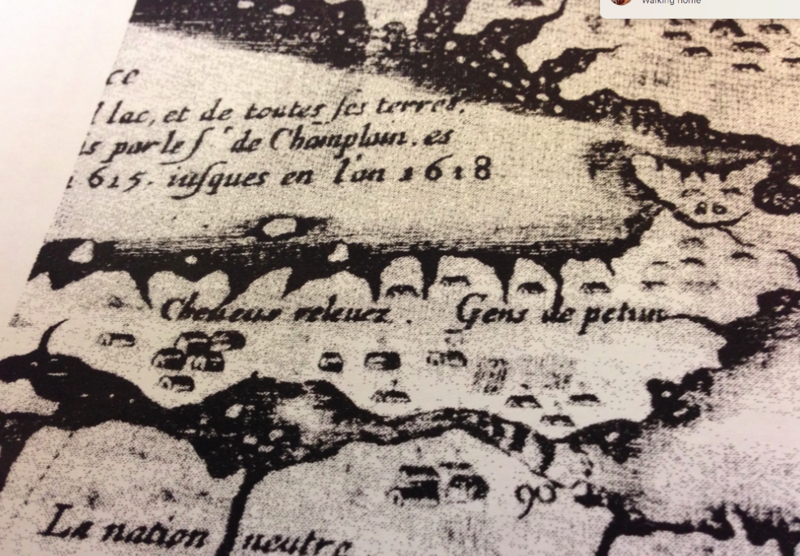 Champlain visited the villages in 1602 and called the people Petun because they smoked tobacco. For years it has been protected. It was explained at a Public Meeting in May 2017 that the application was to consider allowing a Plan of Subdivision to create 3 parcels of land (blocks) to: Create two parcels (blocks) that would be deeded to the Town to establish a public trail at the base of the Nipissing Ridge. Create a third parcel (block) that would be developed into 208 residential units through future processes. The 208 units would consist of 40 single detached residential units and 168 townhouse units. The proposed residential units would be offered as life lease units with each unit being located on an individual land lease. The owner (Parkbridge-Craigleith) would retain ownership and management responsibility for the entire development site. In June 2017 a letter was submitted from BMWTF to the Town expressing concerns about drainage, flooding and run off from development construction impacting watercourses in the Blue Mountain area and Nottawasaga Bay. Due to a number of concerns expressed at the public meeting the developer has reworked the application by making changes to the design and conducting a regional storm water management study. This was explained at a recent public information open house March 27, 2018. A new proposal is looking at 211 chalet-style homes and townhomes that are to be located to protect the ridgeline of the escarpment open space, and archaeological sites. The developer will be resubmitting applications to the Town.